This padded cap is designed to make steel helmets fit more comfortably. 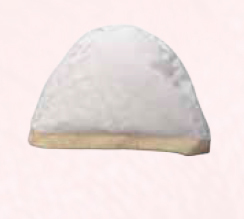 The cap is made of two layers of cotton quilted together with a layer of padding. The lower edge is bound with additional fabric. Helmet liners of this type have not survived. However, given the fit and comfort level of the helmets that have been found, something similar was likely worn. This page was last modified on 16 November 2014, at 14:30.